Magnum Power (7346) is a hard to find set released only in 1976. It was the only new item in an assortment that re-released several earlier blue box sets in the late issue orange frame box. The rifle comes with three different removable scopes, all of which are tough to find. Other accessories include rubber strap binoculars, a map and case, a brown bullet proof vest, an unpainted walkie talkie, and a ultra cool brown camouflage outfit. The same cammo was also used for the Thrust into Danger set. 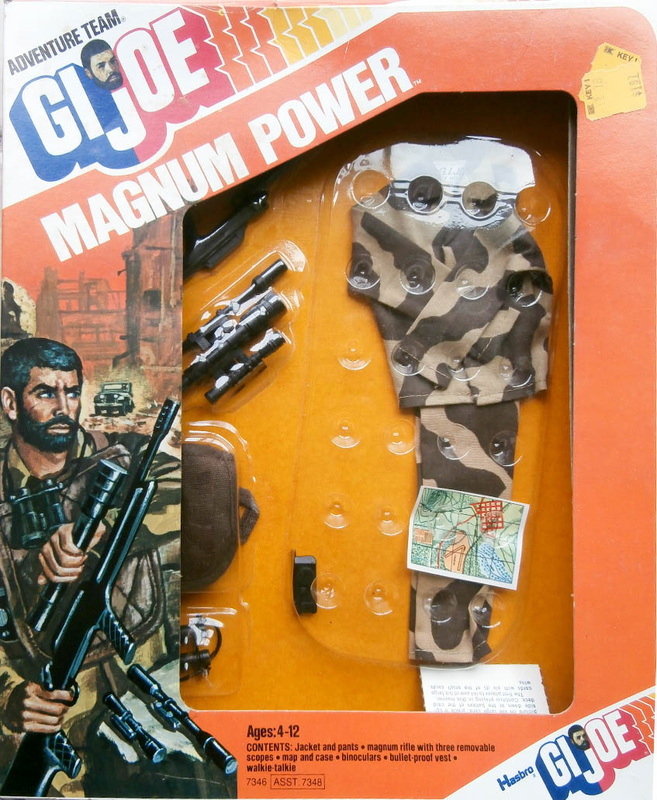 Perhaps the rarest boxed set of the Adventure Team line, the image of Magnum Power below comes courtesy Of Mark Otnes of Patches of Pride and The Joe Report. The set is currently in the collection of Chris Short.